Come and relax in a serene beach setting. 'City approved'. 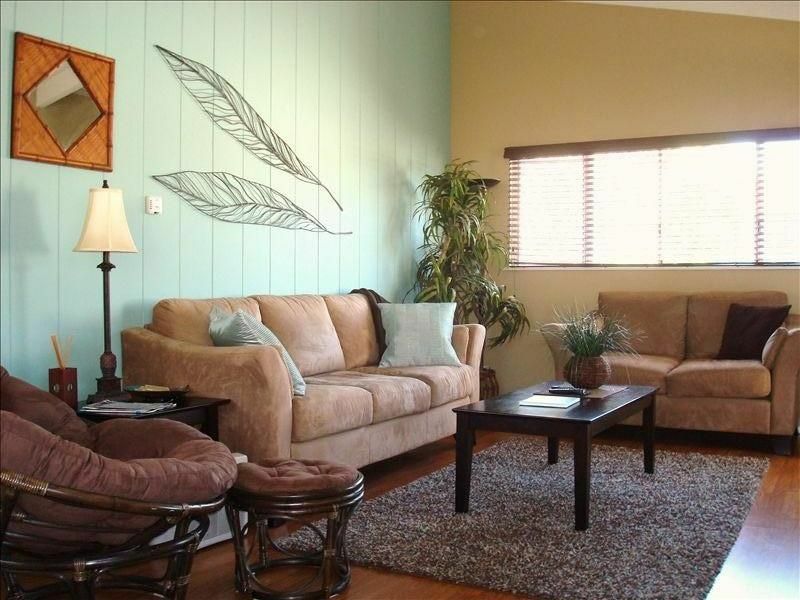 The Bamboo Loft is a fully equipped second story apartment. This spacious apartment has been tastefully decorated and appointed with modern appliances and lovely furnishings. The bedroom has a beautiful hand carved (in Balai), four poster bed and there are high beam ceilings throughout. There are many large windows, allowing cool ocean breezes as well as a 'peek-a-boo' view of the water. The apartment is just 20 steps to the sand for your easy access to the beach. We are happy to provide you with boogie boards, beach chairs and an umbrella-no need to worry about bringing them! There is an outdoor shower for rinsing off after your day at the beach. Seal Beach is ranked by Forbes as the fourth friendliest city in the US. It's a beautiful quiet beach community, with shopping and world class restaurants all within walking distance. The town is one of the few quiet southern California beach towns remaining. The town has a Midwest hospitality with a California beach environment. You will love a morning walk to breakfast or just a stroll on the Seal Beach Pier. The nearby Pacific ocean keeps the temperature moderate year round. The city is midway between all the sites of Orange County as well as the excitement of Los Angeles/Hollywood. Disneyland is 11 miles away. 'Surf City' Huntington Beach is approximately 3 miles down scenic Coast Hwy. Catalina Island is a 2 hour boat ride away, a must see. I was there for two weeks for work and this was a perfect place to stay. The accommodations were perfect. Everything you need is within walking distance. Carol and Don are excellent hosts. Thank you for your gracious review. We were glad we could make your quick business trip as enjoyable as possible. We're here when you're ready for a relaxed vacation too. Hope to see you back. Great place, right on the beach. Super friendly and helpful owners. Walking distance to downtown area. Great trip with the kids! Great to hear you and your children enjoyed your stay. You created some lasting memories for them especially that night of the amazing sunset we all witnessed. Thank you for sharing your experiences. Clean and quiet. ! block from the beach. Beach bungalow on 2nd floor. Good service from Don who lives on property in another dwelling. There is parking off street for one vehicle and more parking on street at the end of the road. I stayed for almost a month. No issues or complaints. Good all the way around. I would stay again. Thank you for your thoughtful and informative review. Thank you for taking the time to post this. We always appreciate other opinions. Thank you for the great review. Glad we could give you a break from single digit weather for a few days. My wife and I loved our stay. Don was very friendly and accommodating. The area was very quiet and a short walk to the beach and pier. There is a reserved parking spot. My husband, 2 kids, and I had a great stay. The location was fantastic and the apartment was perfect for us. We appreciated the beach toys, basic kitchen supplies, coffee, and amply towels and bedding. We will definitely consider staying here on a future visit! Thank you for the considerate review. Your children are adorable. You are more than welcome anytime you want to come back. Be sure and check back early with us to guarantee your dates. Thanks for choosing us. Seal Beach is a beautiful quiet beach community, with shopping and world class restaurants all within walking distance. The town is one of the few quiet Southern California beach towns remaining. The town has a Midwest hospitality with a California beach environment. The nearby Pacific ocean keeps the temperature moderate year round. The city is midway between all the sites of Orange County as well as the excitement of Los Angeles/Hollywood. Disneyland is 11 miles away. 'Surf City' Huntington Beach is approximately 3 miles down scenic Pacific Coast Hwy. Catalina Island is a 2 hour boat ride away, a must see.